The artisan gardens, a ribbon of tiny, precious gems hidden behind the main show gardens at Chelsea can be astonishingly beautiful. 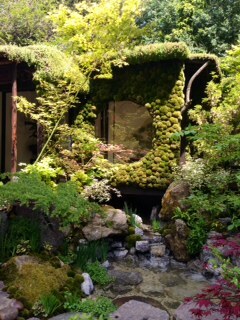 Togenko, A Paradise on Earth by Kazuyuki Ishihara was possibly the most covetable garden I have ever seen at Chelsea. The soul of this one is the story of Togenko, a place of beautiful scenery where people can forget their troubles, but once seen, it can never be revisited. Moss, small leaved Japanese maples and calm, running water helped make this the most serene and soothing of spaces. The tiny hobbit house, clad with moss cobbles has a window, framed by a green roof reflecting the water below. This is somewhere I could happily spend my days and nights, listening to the softly falling water under the open window. Moss has been a feature of my own garden from the outset. Whilst so many gardeners spend their lives trying to remove it, I positively encourage its growth, keeping some of the paths and brickwork in the garden deliberately damp and shaded to assist its spread. The small, wire-cut French bricks that line the floor of the tiny courtyard outside the kitchen window are particularly good for attracting a velvety green carpet. My annual trip to Japan always leaves me wanting more moss at home. The mounds of green fleece there have been tended, respected even, for centuries. They thrive in clean air and damp atmosphere, neither of which come easily in a city. The azaleas there seem to float on a soft emerald cloud, something to sit and dream about in my own little London garden, watering my little patch of moss.